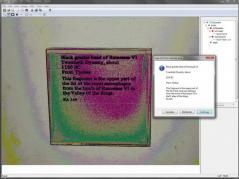 GT Text is a simple application that lets you easily extract text from scanned images. It relies on an algorithm designed to detect the precise positions of pixels which are part of a character to rebuild text. Once you load the file and select the text containing area, the program will analyze the image and display detected characters in a dedicated window. They’ll also be stored on the clipboard so you can quickly paste them into other applications and documents. English is the default recognition language but there are other languages you can download and install. GT Text can process the text from an entire image or just the selected area.